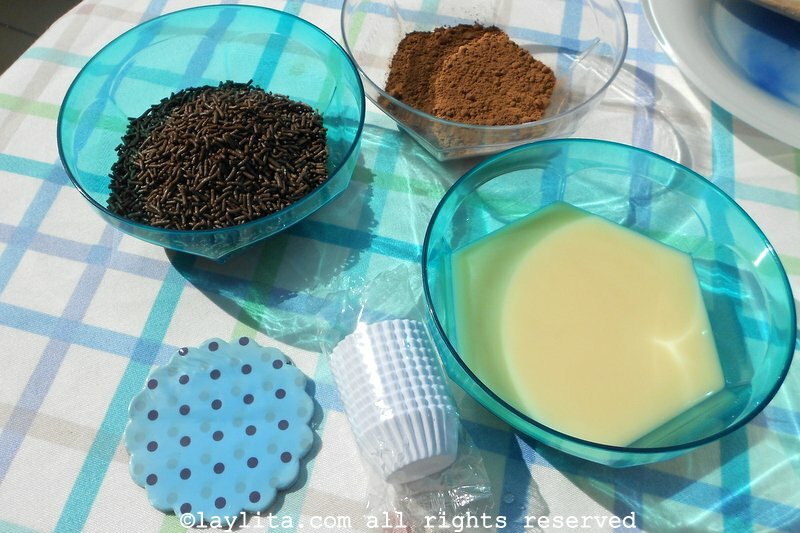 Recipe for homemade brigadeiros, a traditional Brazilian chocolate truffle made with cocoa powder and condensed milk rolled in chocolate sprinkles. 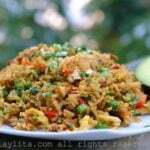 This recipe and text is contributed by Andressa Vieira. 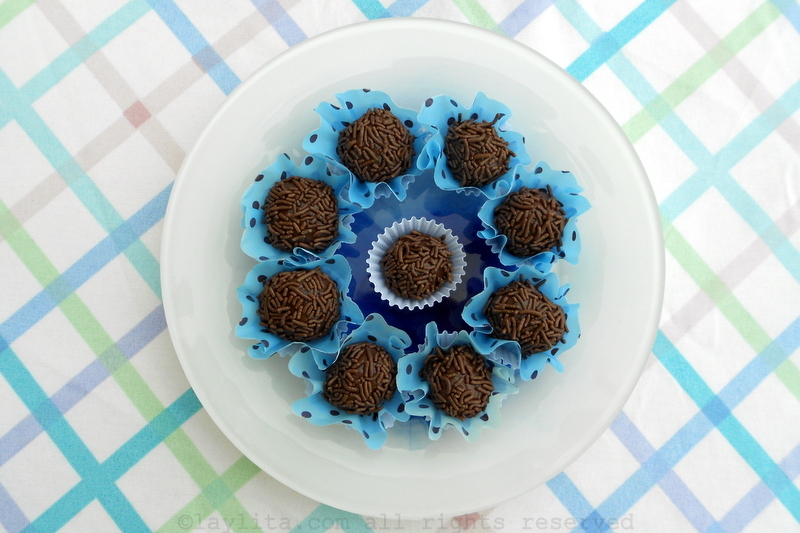 She also shares ideas for different brigadeiro variations (including vegan) and an easy homemade condensed milk recipe. These tasty and addictive sweets are soft and fudge-like on the inside with crunchy chocolate sprinkles on the outside. 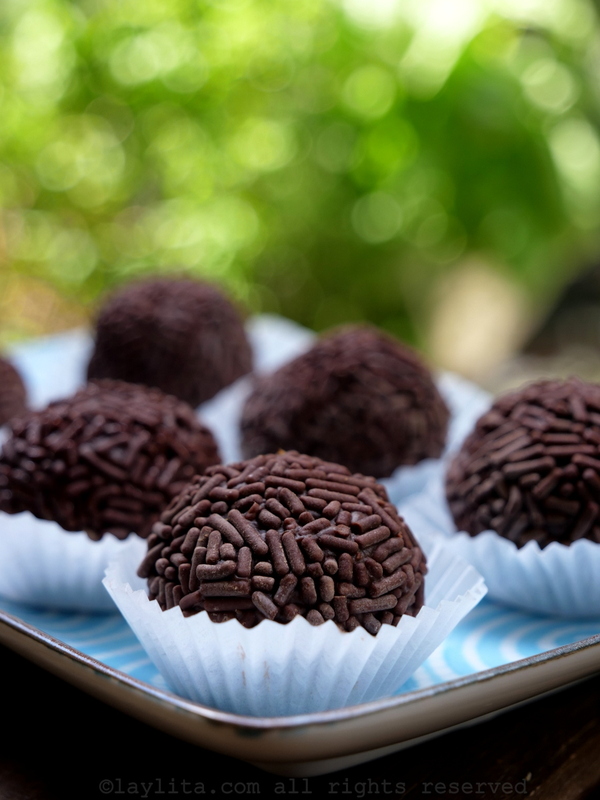 More than a just a simple sweet candy, the brigadeiro has become a way for Brazilians to show affection, specially to kids, but most adults can’t resist to the charm of this delicious treat. So much that nowadays brigadeiros are given as gifts. Because almost everybody likes it – actually, some people don’t like it so much or, worst, they prefer the white variation. 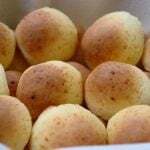 But that’s ok, because a few years ago, a new trend was born, the “gourmet brigadeiro”, with new flavors such as lemon, passion fruit, cinnamon, ovaltine (malted drink), powdered milk, strawberry (also called “bicho-de-pé”), nuts, guava jelly and cheese. There are even more sophisticated variations, inspired by world cuisines, like crème brûlée brigadeiro and the ginger brigadeiro. But the traditional chocolate brigadeiro is unbeatable. It’s made with only three ingredients (actually, only two are essential), it’s very easy to make and is ready to serve in less than 20 minutes. Chocolate or cocoa powder, condensed milk and butter or vegetal cream (margarine), a small pot and a wooden spoon: that’s all you’ll need. Once it has cooled down, all you have to do is mold it into little balls and cover them in chocolate sprinkles. Although it’s high in calories and it has a lot of sugar, condensed milk is the base of many Brazilian desserts. When I was younger, I thought it was the base of desserts and sweets all around the world. When I lived in Switzerland, I missed condensed milk and couln’t find it at the local stores. One day at a friend’s home, who already lived in Europe for more than ten years, I asked her where I could find it. She told me that “almost nobody likes it” there, and sometimes they use it in coffee (Oh God). I found it in a tube at the market, so hidden that we had to look for it. In Brazil, we have many shelves full of condensed milk, made by many brands, but there’s one brand that is the favorite one. Ironically, a swiss brand. I don’t get it. Last week, I asked my sister, who lives in Germany, how they relate to condensed milk. She told me that it’s almost forbidden there (!) because it’s full of sugar (indeed), and it barely has nutrients. She goes to chinese markets – which “sell everything” – and to Brazilian or Portuguese stores to buy her condensed milk can, so sacred for us as the “farinha láctea” (also despised over there), Antartica guaraná and “cuzcuz” (corn flour), as well as manioc flour and beans. So, how to reconcile the fact that a product almost forbidden in developed countries is so loved in Brazil? We give condensed milk to our children, and we eat almost every week something made with it, be it in our “pudim”, in sweet treats, cake fillings, cold desserts. We even make “doce de leite” with condensed milk. I think the solution is moderation. We can’t eat only condensed milk, as well as we shouldn’t eat too much chocolate or hamburguer, or french fries. I know condensed milk is unhealthy. 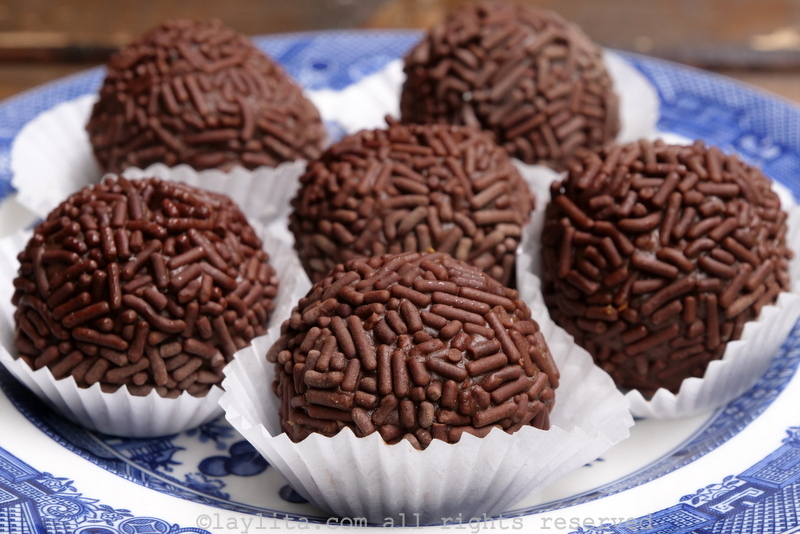 But I’m sure that, when I have children, I’ll make them brigadeiros. I think there’s more to food than only the ingredients. There’s the love we put in it. And brigadeiro is full of love. 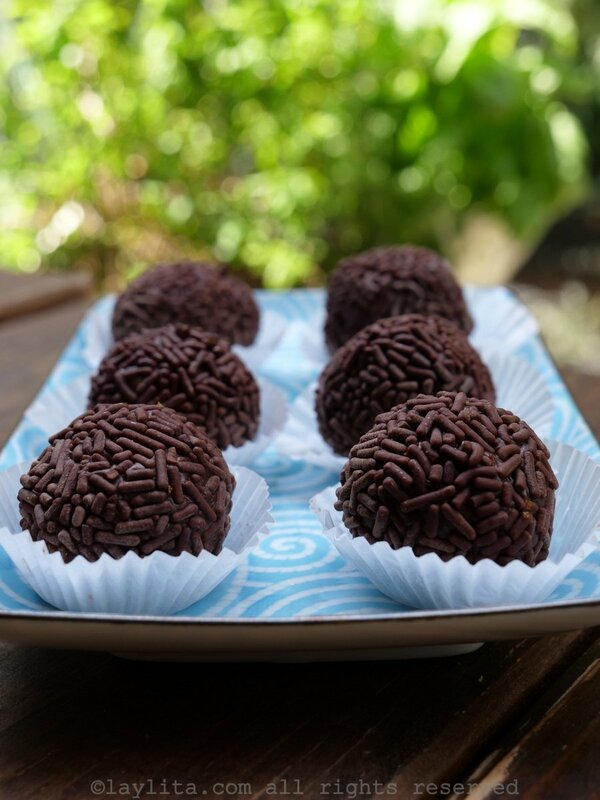 In this post, I included the recipes of the traditional chocolate brigadeiros, and suggestions for some of the most common variations: coconut (beijinho de coco), cashew (cajuzinho), strawberry (bicho-de-pé), bem-casado. You can also find the recipe for homemade condensed milk – which you can adjust the amount of sugar to your preference. You can also make a vegan variation of brigadeiros using soy condensed milk, and replacing the butter with margarine or a vegan butter. You can find soy condensed milk in vegan stores. It’s more expensive, but I find it tastier than the traditional, because it’s lighter and less sweet. 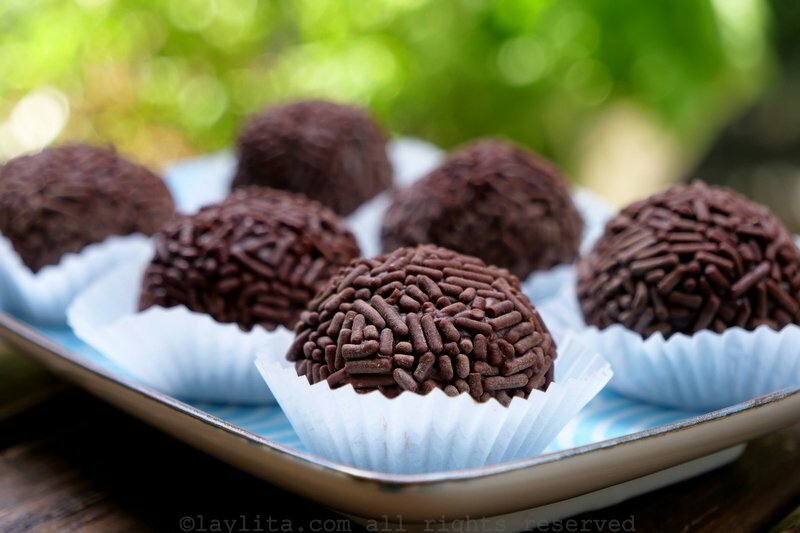 Recipe for homemade brigadeiros, a traditional Brazilian chocolate truffle made with cocoa powder and condensed milk rolled in chocolate sprinkles. Also includes some variations, and how to make homemade condensed milk or vegan condensed milk. Use soy powered milk instead of cow milk, and vegan margarine instead of butter. In a small pot, put the condensed milk, the cocoa powder (if you want, you can sift it) and the butter. Cook it over slow heat always mixing with a wooden spoon or spatula, until it sticks out of the pot bottom. This is important: when you tilt the pot a little bit, you'll notice that the brigadeiro “slides”, sticking out of the bottom. Turn the heat off and pour it over a platter lightly greased with butter. Let it cool down. Then, grease your hands with butter and mold the brigadeiro in little balls, taking small portions of the chocolate mix with the help of a small spoon. Cover it with chocolate sprinkles and then put it in little paper molds or on a platter lined with wax paper. Put all ingredients in a blender (put the hot water first, carefully) and blend it for at least 2 minutes, being careful not to burn yourself. You can add a teaspoon of vanilla extract if you want. Store it in a container with a lid and leave it in the fridge until it thickens a little bit. It can be used to prepare all recipes that call for condensed milk, including “pudim” (a type of flan). Follow the same instructions above, but use soy milk instead of cow milk, and use a vegan margarine instead of butter. If you want to prepare a “coconut brigadeiro”, which we call “beijinho”, use dried coconut flakes instead of chocolate/cocoa powder. Instead of covering the little balls in chocolate sprinkles, use coconut flakes (dried). If you want to prepare “cashew bigadeiro” (cajuzinho), use peanut or cashwew powder instead of chocolate. Use it also to cover the little balls (you can also mold the candy as little “cajus”, a typical Brazilian fruit). There are many other variations using the same base, for example, “surpresa de uva” (grape surprise), or a strawberry variation (use strawberry Nesquik instead of chocolate and red granulated sugar instead of traditional sugar). I had almost forgotten about these, I think I will make a batch soon! You may be interested to know that sweetened condensed milk is somewhere in between those extremes in the US. There are several varieties (one of which has Swiss in the name) and it is not uncommon in our desserts, especially more “old-timey” recipes.